LEN - www.lankaenews.com | Central bank freezes a most ‘Honorable’ high profile minister ‘s account ! Rs. 150 million received sans proper explanation !! 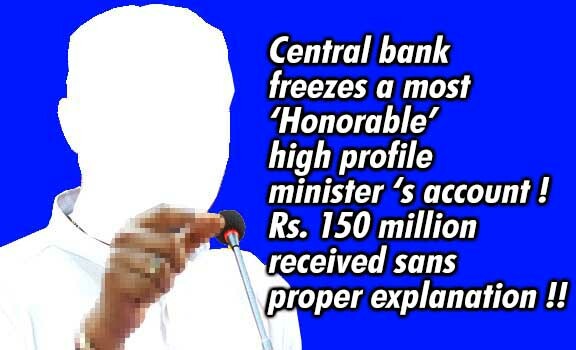 (Lanka e News – 03.Oct.2018, 11.30PM) The personal bank account of a high profile minister was frozen on the orders of Central bank , and investigations have begun. This most ‘honorable’ minister has recently received Rs. 150 million into his account . This sum has been remitted to his account by a Muslim national residing abroad. Since the questions , why this money was received ? What is the transaction between the remitter and the account holder ? were not satisfactorily answered by both parties , the Central bank has frozen this account temporarily and commenced investigations. There had been a balance of Rs. 400 million in the account of the most ‘honorable’ minister even at the time the sum of Rs. 150 million was received .All these monies have been received after this government came into power. According to information garnered by Lanka e News , this most ‘honorable’ minister has plundered Rs. 1700 million from the public via a scam during the recent past. Lanka e News always frank , forthright and fearless in its exposures regardless of the rank or status of the culprit shall soon disclose details including his name with all the evidence.